This question was asked by a client whose sister died in mysterious circumstances. The client believed that she had been murdered by her husband. The symbolism in this chart is both stunning and simple. The Sun and Moon are in close conjunction in Libra, the sign of marriage and relationship. The Sun would obviously be the husband, the Moon the wife. The Moon is at the very end of its cycle and is about to disappear altogether into the Sun. The wife is about to lose her life at the hands of the husband. The conjunction of the Sun and Moon is in opposition to Uranus in Aries, which symbolises a sudden act of violence. This opposition projects onto a T Square apex Pluto in the 8th house ( the planet and house of death ). 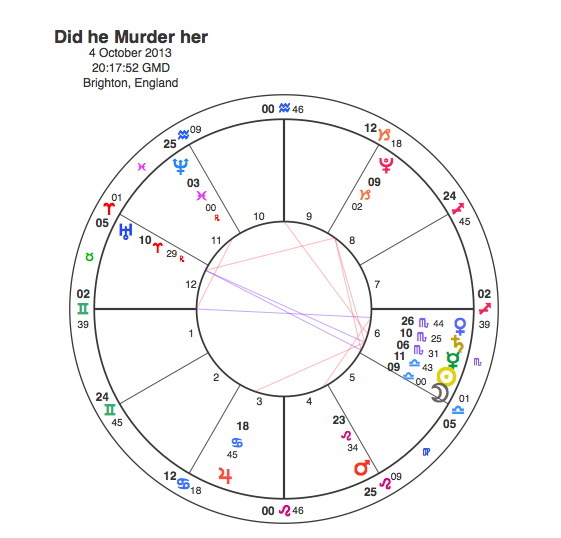 The incredible closeness of the aspects between the 4 planets particularly the Moon to Pluto ( death of the wife ) gives a powerful answer to the question. The chart seems to be saying he is guilty. Strikes me as a highly radical chart and I’d agree with your conclusion. Difficult for the truth to come to light with all that Scorpio. Your client (Mercury in Scorpio) worrying in the 6th about her sister’s death which is signified by Saturn in Scorpio as ruler of the 8th from the 3rd: her sister – as you say – the Moon ‘afflicted’ by the Sun ‘husband.’ He is also signified by Saturn (ruling 7th from 3rd) suggesting his involvement in her death, but how could it be proved? Hope your reading gave some ‘closure’ or comfort to your client, what a horrible thing to have to deal with. You’re reading of it is spot on. I’ve DM you with some details of case.